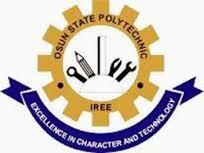 Osun State Polytechnic (OSPOLY), Iree Full Time National Diploma [ND] Post-UTME Admission Screening Exercise, Entrance Examination Schedule for 2018/2019 Academic Session. [Cutoff Mark: 150], Eligibility and Application Guidelines. Authorities of the Osun State Polytechnic (OSPOLY), Iree invites all candidates who have applied for admission into the Institution’s various National Diploma (ND) Full-Time programmes for the 2018/2019 academic session to register for the Post-UTME screening exercise. Deadline: Those who are interested to pursue any National Diploma Program in the polytechnic can still obtain the form before the end of January, 2019, while their admission will be processed promptly..
Further Clarifications may be obtained via email:info@ospolyiree.com or the following phone numbers: 07059397105, 08122088411, 08030862530. The Polytechnic has zero tolerance for cultism, drug abuse or any anti-social behavior.